One of the most common questions we’re asked at Solar Power Australia is how much it will cost to power an average home using solar. The reality is that power use differs wildly between different homes, depending on what appliances are used and how much they are used. Some people survive quite comfortably on 6kWh per day, whereas others struggle to keep their daily power use under 60kWh. Grab one of your energy bills where the graphs are displayed. Compare the graphs of the current bill, and the same time last year, and it will indicate how many kWh (kilowatt hours) your household uses a day. It’s also interesting to note the difference between the summer and winter usage. 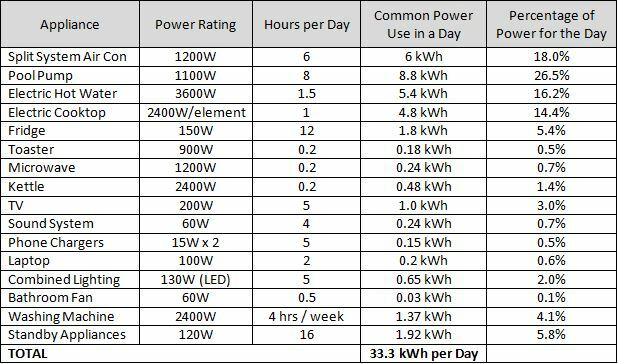 Reducing your energy costs and choosing a correctly sized solar or battery system is greatly assisted by understanding where all the power is going – so let’s have a look at the power consumption of some common household items. As a reference point, we’ll use an appliance that almost everyone has – a standard domestic fridge – which tends to use around 1.5 kWh a day. Let’s start with big consumers first. Generally speaking, one of the most energy hungry processes is any form of temperature conversion – both heating and cooling. Top of the list for common power guzzling is central (or ducted) air conditioning. These units can range anywhere from 5,000W to 20,000W, so can use more power in one hour than many homes use in an entire day! A mid-sized central air conditioner for 8 hours a day might use 30 – 40kW. Any form of electrical heating – cooktop and oven, hot water, bar and fan heaters, hair dryers, kettles, heat lamps, in-floor heating, coffee machines, etc – use a lot of power, often as much as a standard Australian wall socket will allow, which is 2400W. The impact on your bill depends on how much you use the appliance each day. A coffee machine is only on for a short time so might add up to 0.7kWh a day. Another typical impact on domestic power bills is a pool pump. Pumps often fall in the power range of 700W to 1500W, but many household pumps only run for short periods so don’t make much of a dent. A pool pump however is often set to run for about 8 hours a day, so can account for 8 – 10kWh per day. Once solar power is installed, a pool pump is a prime article to run during the day to make use of the solar generation. Power tools can have large power draws but, except for enthusiasts and home workshops, usage of power tools is often infrequent and doesn’t account for a large percentage of the total. Most other appliances fall into a group of items with smaller power consumptions, but where these can impact your power bill is if they are run for significant periods of the day. Take halogen downlights for example – a home could have 20 lights at 50W running for 6 hours a night, which equates to 6kWh per day. An NBN router may be 90W – over a day this adds up to 2.2kWh, but when you combine a few other small loads running constantly together, this can account for large portions of your bill. Small loads can really add up! Electricity is invisible but we have a variety of tools and tricks to track where it’s going. There are some great monitoring packages available now that break everything down into easy-to-understand graphs. our staff at Solar Power Australia have a lot of experience in finding the best option to maximise the value and return of your solar or battery purchase. Contact us on 02 4954 3310 or [email protected] to discuss your project further.